What Is Avmacol® Extra Strength? Click here to share with us! Avmacol® Extra Strength may be swallowed or crushed and mixed with foods such as yogurt, applesauce or smoothies for easier consumption. The Maitake mushroom extract (Grifola frondosa) works in combination with sulforaphane to support your body’s natural detoxification process better than sulforaphane alone.1 In addition, the Maitake mushroom extract found in Avmacol® Extra Strength provides the added bonus of immune support by promoting neutrophil function and natural killer cell activity. Click here to learn more about how Avmacol® Extra Strength works. The combination of sulforaphane and Maitake extract supports the movement (or translocation) from the cytoplasm to the nucleus of NRF2 and increases the levels of certain Phase 2 enzymes. Click here for images of a technique called immunofluorescence which illustrate how much protein is being produced in the cell and the location of that protein. Why Is Sulforaphane So Important? When sulforaphane enters your cells, it helps increase the production of important Phase 2 detoxifying enzymes, promoting your body’s natural detoxification process, thereby supporting the elimination of potentially harmful metabolites. These harmful metabolites may cause damage to DNA, proteins and lipids in your cells. Read more about your body’s natural detoxification process here. 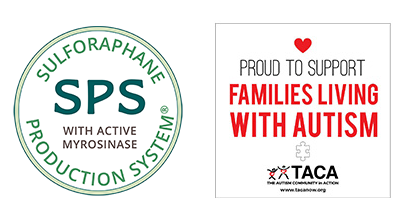 Active myrosinase enzyme is essential for the conversion of glucoraphanin (sulforaphane glucosinolate) to sulforaphane. 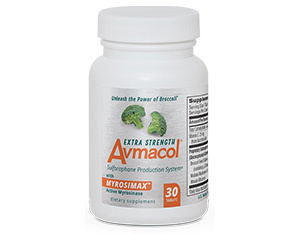 Without this enzyme, it may not be possible to reap sulforaphane's many health-promoting benefits, which is why you’ll always find active myrosinase enzyme in the Avmacol® brand family. Click here to learn more about the importance of having an active myrosinase enzyme. 1In a laboratory study, treatment of RAW 264.7 cells with the combination of Maitake mushroom extract (Grifola frondosa) and sulforaphane resulted in greater induction of the expression of the Phase 2 enzyme NQO1 than either individual component alone. Serving Size Information: One (1) tablet daily. Directions for Use: Take one (1) tablet per day with a meal. If you have a condition that requires medical attention always consult your physician before taking any dietary supplement. To receive product and availability updates, please sign up below. Yes, I wish to receive electronic promotions, special offers and new product information from Nutramax Laboratories Consumer Care, Inc. ("Nutramax"). I understand I can unsubscribe at any time. Emails and other marketing communications from Nutramax, including offers or promotions contained therein, are intended for and available to United States residents only. By checking the box, I certify that I am a resident of the United States and at least 18 years of age.